Get quality products and quality advice when you shop with us for flooring in Los Feliz CA. Looking for new flooring in Los Feliz CA? You’ve come to the right place. Monarch Carpet, Drapery & Upholstery has been in the flooring business since 1937. We know the best brands and products in the industry and we care about your satisfaction. Back all our installation work with a total satisfaction guarantee. Whether you want a plush wool carpet for a formal room or a more durable option for a high-traffic area, we can help. We want you to love your new carpet so we’ll be happy to send you home with plenty of samples to try in your space. We have expert carpet installers on staff who will lay your carpet without a lump or bump, guaranteed. Wood is a very traditional material, but a wood floor can also look quite contemporary with the right design choices. We can help you customize your look with different hardwoods, stains, finishes, and plank sizes. Let us install your hardwood floors and this should be the last time you shop for flooring, provided you take good care of your new wood floors. Mimic the look of wood, slate, stone, or tile with versatile and durable laminate flooring. Buying your laminate floors online can be risky because sometimes what seems like a bargain turns out to be an inferior product. 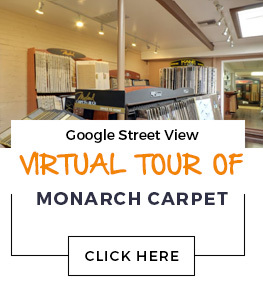 Come to Monarch Carpet, Drapery & Upholstery where we have pre-selected the best affordable laminates and you can see them in person before you buy. Even if you have kids or pets, you can rest assured that any laminate product you buy from us will be tough enough to stand up to their abuse. Vinyl flooring has undergone a veritable renaissance in the past few years. We know our customers demand quality so we have collected some of the best-made products in a tremendous variety of colors and patterns. Vinyl installs easily over most existing flooring and performs extremely well in damp areas like bathrooms, laundry rooms, and kitchens. What are you waiting for? We can help you select and install the perfect vinyl floors. When you’re looking for custom area rugs–especially natural fiber area rugs–you can rely on Monarch Carpet, Drapery & Upholstery. We started out providing rug binding, serging, and repairs in 1937 and today we continue to provide expertly made area rugs. We have all kinds of finishing options to choose from including cotton, leather, and faux leather. Ready to Shop for Flooring in Los Feliz CA? Our expert staff is ready and waiting to help you find the perfect flooring in Los Feliz CA. To learn more about what we have in stock, give us a call at (877) 766-6272. Better yet, come visit our showroom to see and touch flooring samples for yourself.